fishing in lake Varpan. You can buy fishing permission online here. Here is a link to the map over the fishing area. Scroll down to the bottom of the page. hiking from Falun to Rättvik with its surroundings. 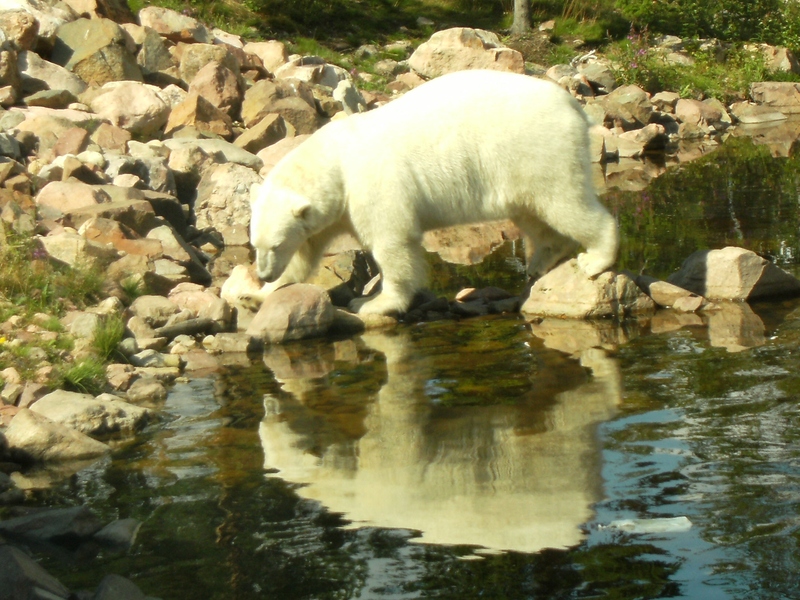 visited museums like, the coppermine in Falun, the home of Karin and Carl Larsson, the Zorn museum, Orsa park for predators, Grönklitt park for bears. participated in different competitions during the week of Vasaloppet. watching the >> FIS CROSS-COUNTRY WORLD CUP, usually in february. visiting relatives, been to parties and gone married. In Sweden You drink the tap water, we all do. In general there is no chlorine in the water, there are places it is needed. At our B&B we have our own well. It is drilled in the rock down to a depth of 90 meter (98 yard). It has been tested and proven well as drinking water. It do contain flouride, so really small kids, 6 months and younger should not drink it. It is motivated by that they can get white spots on their teeth later when they grow up. In most “eating places” they serve something called “Dagens lunch” (Today’s lunch). Serving hours can vary a bit, but around 11 a.m. til 2 p.m. is common. A lunch costs about 80 SEK (about 10 USD). Swedish farming is the most regulated in the world. Antibiotics are only given to animals that are ill. Which means that they are kept healthy by good food and living conditions. So Swedish meat has a very low content of antibiotics, if any, and that counts for dairy products as well. Also all eggs are checked for salmonella (and there are very rare outbursts of salmonella ), which means that you can buy eggs and eat them raw if you would like to do so. All programmes on TV are shown and heard in their original languages and often subtitled in Swedish (some in Finnish also). And a lot of the tv-shows and films comes from US and Britain. You can also watch Swedish television for free on the site http://www.svtplay.se. View the lake Varpan from the greenhouse. 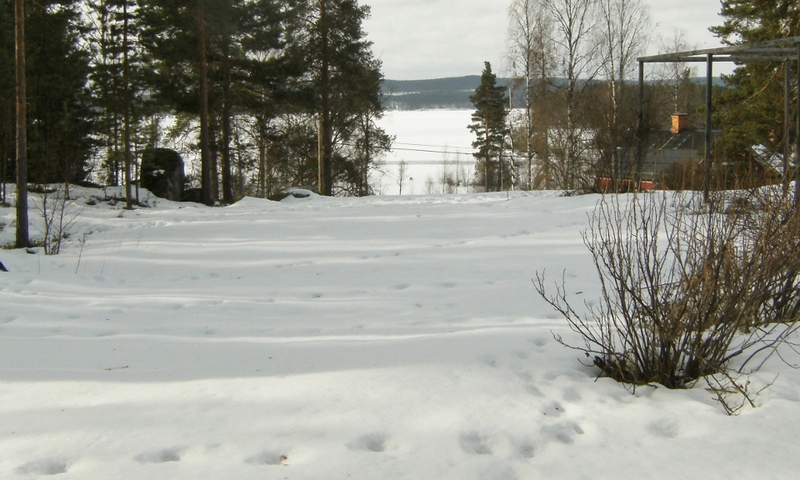 When it has been cold and the snow has fallen, you can ski or skate on the lake Varpan close to the house. Sometimes one of our neighbors volunteers and clear a track from snow for skating on lake Varpan. If You want to be sure of a snowfree track, there is a 15 minutes drive from here to lake Runn. If you want to ski, there is not so far from us ( about 100 m, 310 feet) a track for snowcats which you can use for skiing. For downhill skiing it is about a 30 minutes drive to “Romme Alpin” in Borlänge, one or two hour to Orsa Grönklitt, a three hours drive to Sälenfjällen (Stöten, etc… ) and a four hours drive to Idrefjäll. View from the yard into the woods. From our yard you can also enter tracks for running and hiking and in the summer you can go swimming in the lake Varpan. The beach is about 100 m (310 feet) from our house. In the woods of Dalarna there are bears, wolfs, moose’s or and elks. 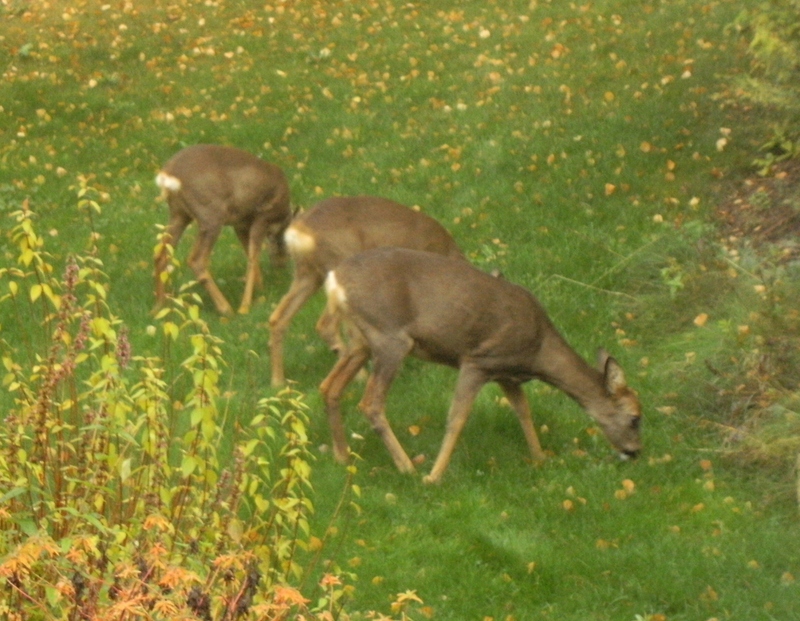 Deers, foxes and hares are running (and eating!) frequently in our garden. To put it short – we have a wildlife. So, apart from jogging, strolling is not only a pleasant way to spend time in the woods, it can also be interesting. 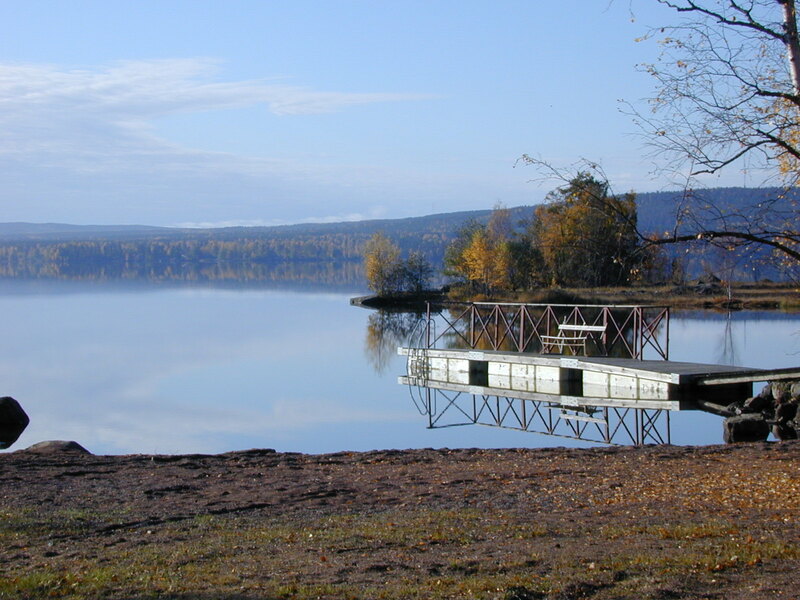 It is about one hour drive to “Grönklitt“, where You can ski in winter but also has a park with wild animals. If You want to see a polar bear for instance. 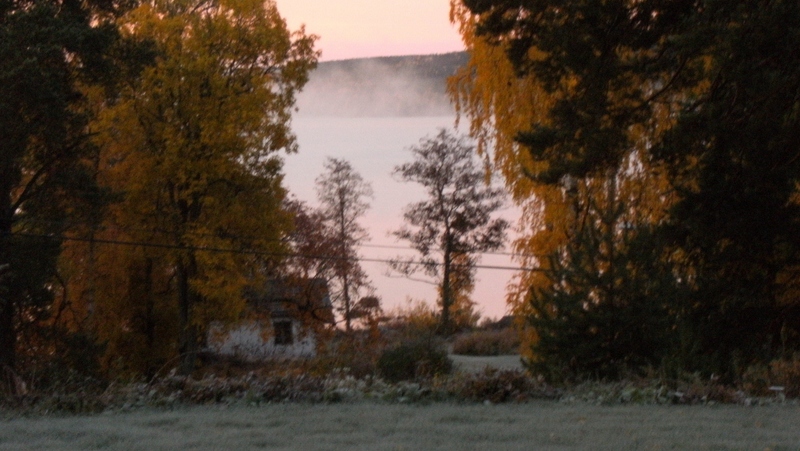 View the morningmist over the lake from the greenhouse. The greenhouse works quite well as a studio. If you are interested in gesture drawing (figure drawing) and life model sketching and painting there are frequent classes at Dalarnas museum in Falun, check in at www.modellteckning.se, (The site is written in swedish but you can still check in dates and sketches). Occasionally there are classes right across our road in “Österå Bystuga“. Dalarnasmuseum also has a lot going on. Zorns museum in Mora is about one hour drive away and Karin and Carl Larssons home in Sundborn is about 20 minutes drive from here. If You are looking for a spacious place and an opportunity to stay over night, the combination of the spacious “Österå bystuga” and our B&B is a possible choice. Check the link >>here to Österå bystugas calender – to see when it is avaliable and who to contact for booking it. Their site is written in swedish only, so if You want me to assist You with checking the calender – let me know by writing me a comment here on the site.